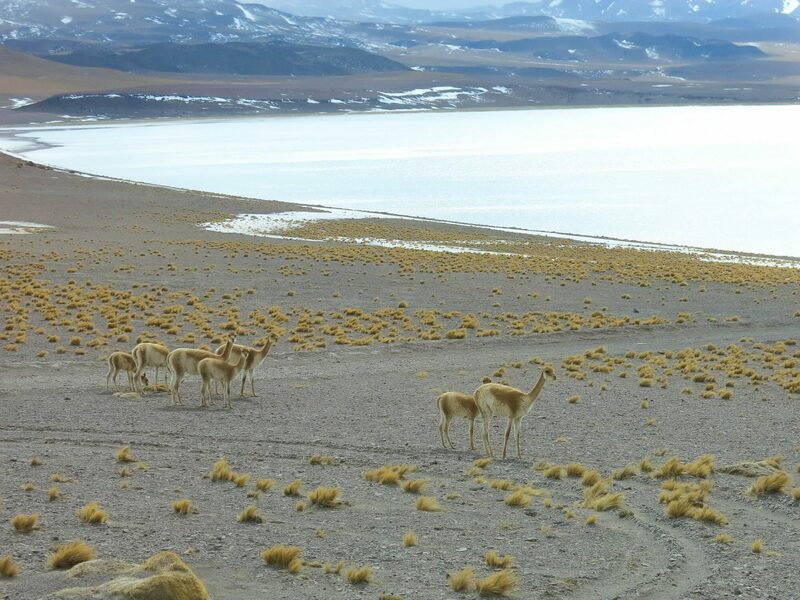 There are numerous Atacama Desert tours that you can book before you arrive or when you get there. 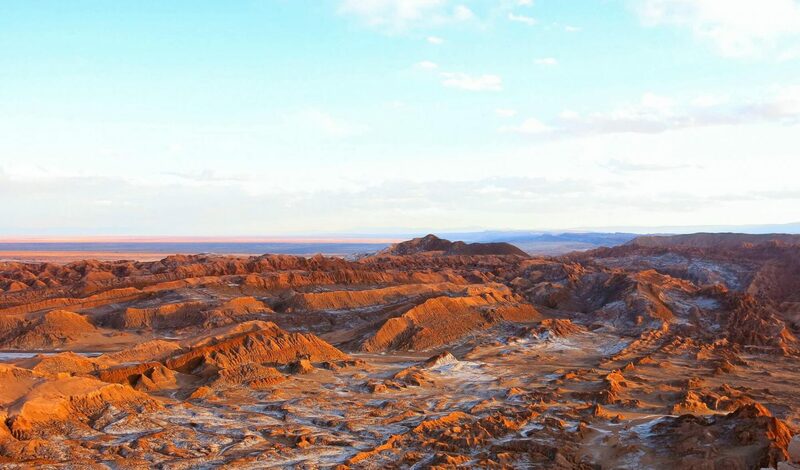 With a lot of information out there it can be hard to know how much time to spend in San Pedro de Atacama. 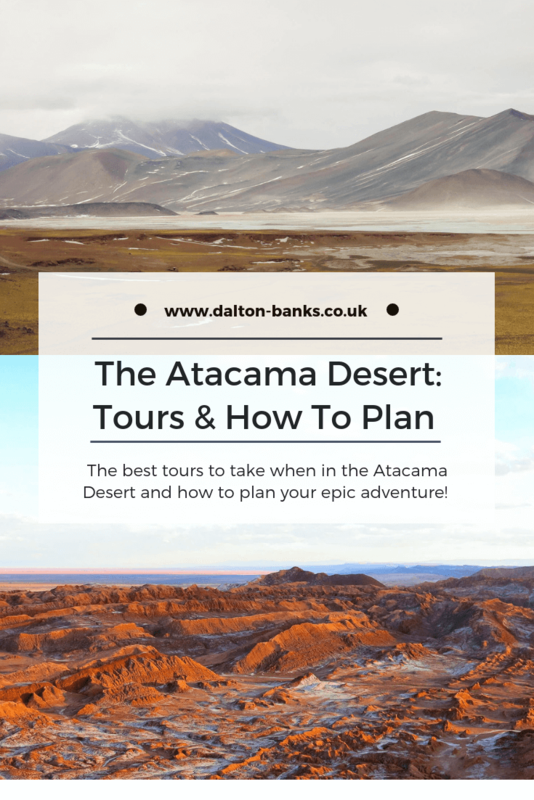 In this blog post I’ll share the different kind of tours you can go on (from day tours to 3 day plus tours) and how to plan your trip to the Atacama Desert. 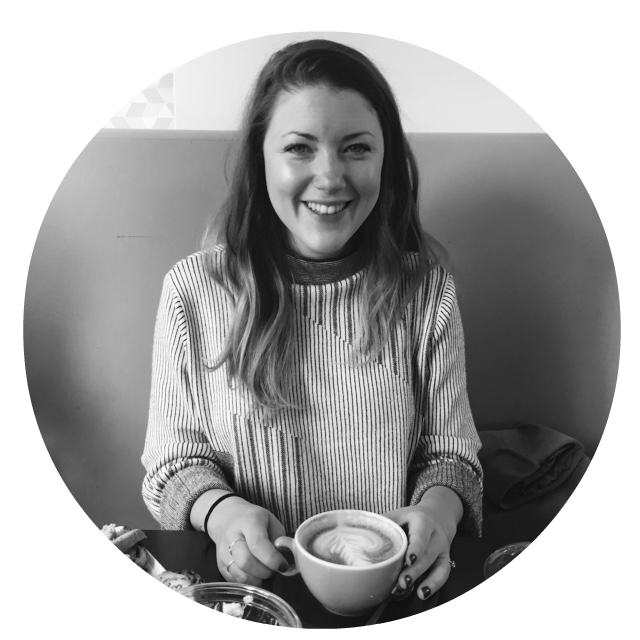 I’m sharing all the things I wish I’d know before my trip! In my 3 week trip to South America, I think the Atacama Desert was the biggest surprise for me. Yes, Machu Picchu is the most incredible site and I spent many hours post trek wandering how on earth it was built and pondering all the stories we’d been told about it’s history. It’s just amazing. But, the Atacama Desert completely took my breath away. It’s just so stunning – even when it’s snowing and you’re freezing to the bone. 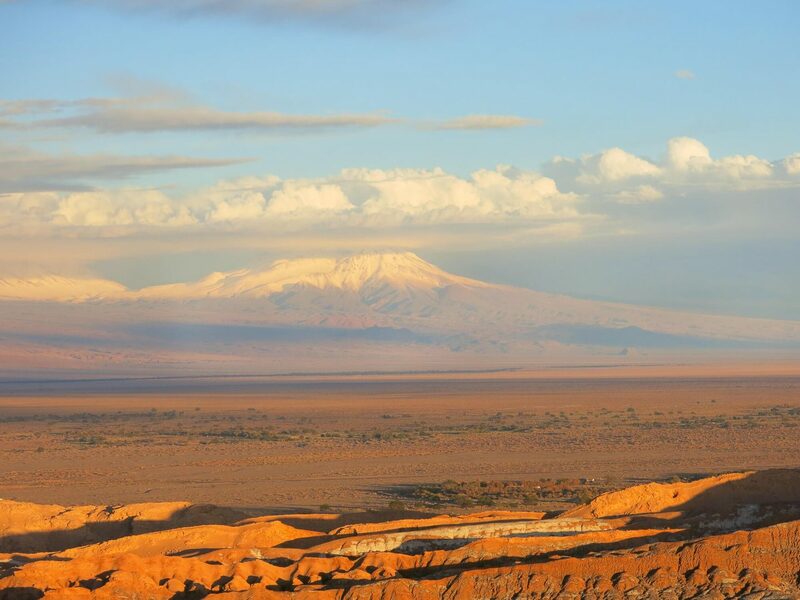 If you are anywhere near northern Chile please visit the Atacama Desert – you won’t regret it! All these photos were taken across just 3 days. From bright warm sunshine to bitter winds and sleet! We only gave ourselves 3 days in this other-worldly place. Which in hindsight was a mistake due to weather getting in the way of our plans. 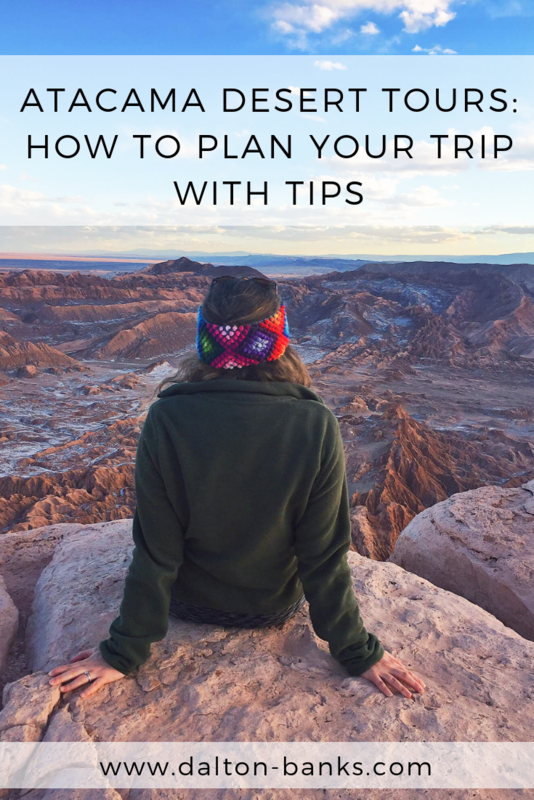 That’s why I thought it would be useful to share tips on how to plan your Atacama desert tours so you can make the most of your trip. The Atacama Desert lies in the northern part of Chile, with the Andes mountains and volcanos lining this incredible area. This desert is very commonly referred to as the driest nonpolar place in the world. So, although we were travelling to this part of Chile in their winter months (we had planned our trip around a good time to do the Salkantay Trek to Machu Picchu) we knew it would be cold but we didn’t think we would get rained off! But, much to our frustration, we did. We were in the driest desert in the world and we get rain and snow! I can’t even begin to explain how cold it was. Everyone knows the salt flats in nearby Bolivia are ridiculously cold, but we weren’t expecting this weather, so a few of the group weren’t prepared. Luckily, there are shops in San Pedro de Atacama where you can purchase good quality clothes for cold weather. It was all about the layers! Even with the weather set back this is easily one of my favourite places in the world. And I will most definitely go back in the summer months to take in more of those stunning landscapes! 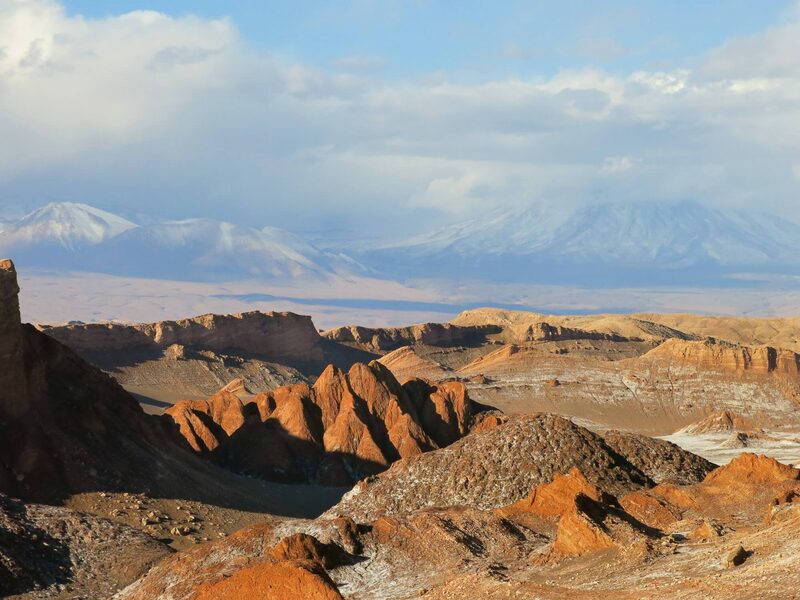 The Atacama Desert lies in the north of Chile and boarders Bolivia and Argentina. 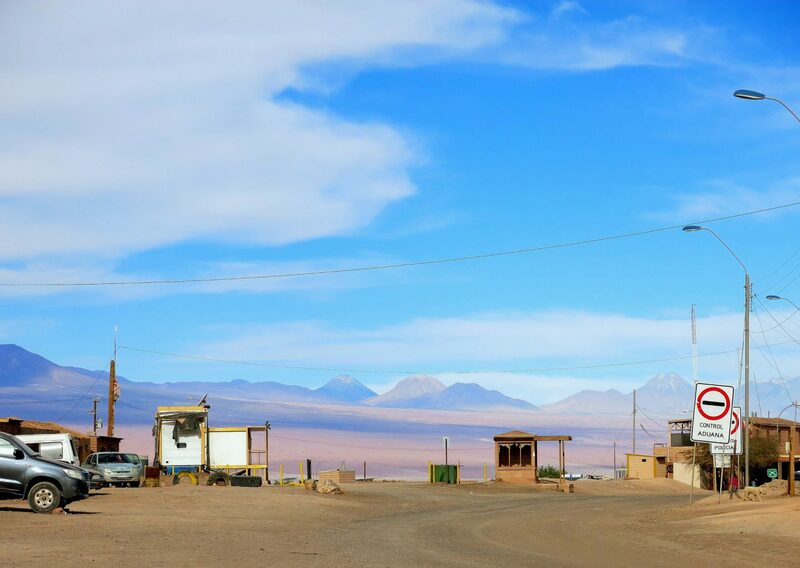 There are such a variety of tours on offer from San Pedro de Atacama so it’s a great base to explore the area from. The unique landscapes and climates mean there will be something for everyone to enjoy. 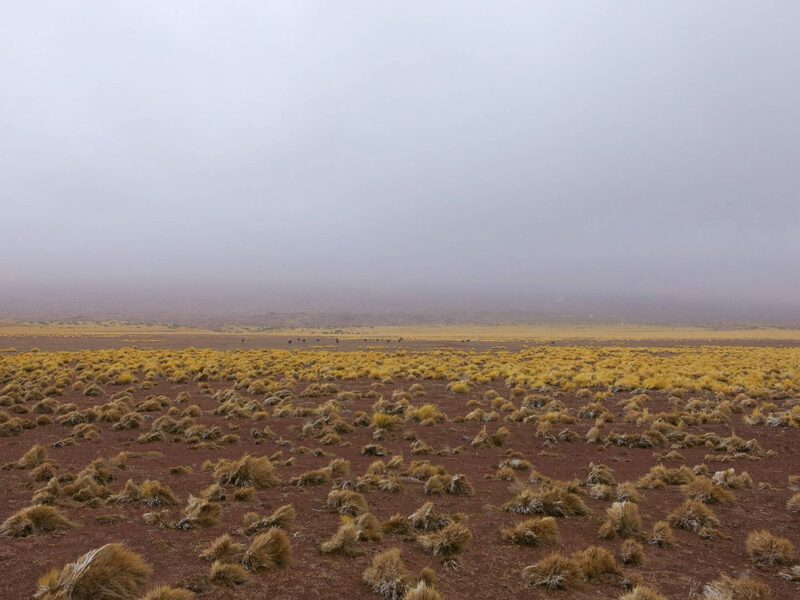 When I told friends about my trip, they didn’t know much at all about this part of Chile and often asked “what is there to do in the Atacama Desert?”. My answer – so much! 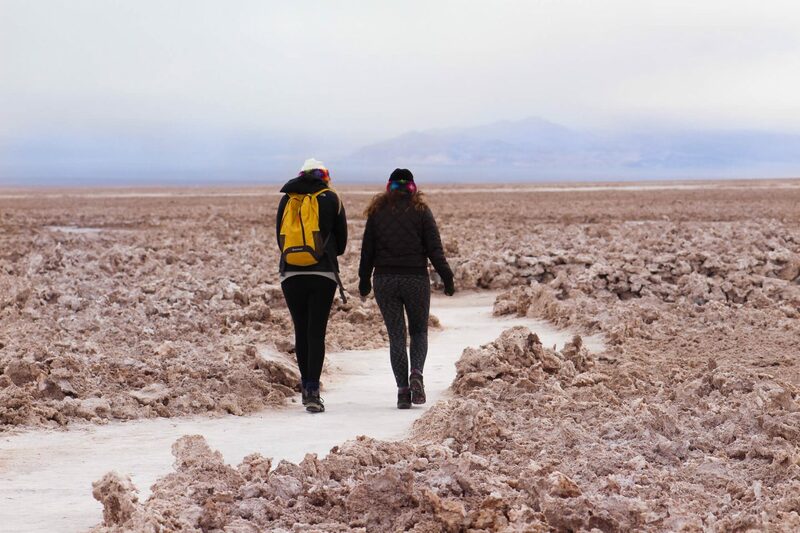 The best day tours from San Pedro de Atacama include: Chile’s largest salt flats, the El Tatio geysers, Valle de la Luna and some of the world’s best observatories. You can rent bikes and explore some of these areas on two wheels, though I would save that for the warmer summer months! The Salar de Atacama, or Atacama Salt Flats are the largest salt flats in Chile. They lie just 11 miles out of town so these are easy to make a visit to. You can arrange a tour or rent a car and go it alone. Most tour operators offer this tour with other trips. We stopped here on the way to Piedras Rojas. 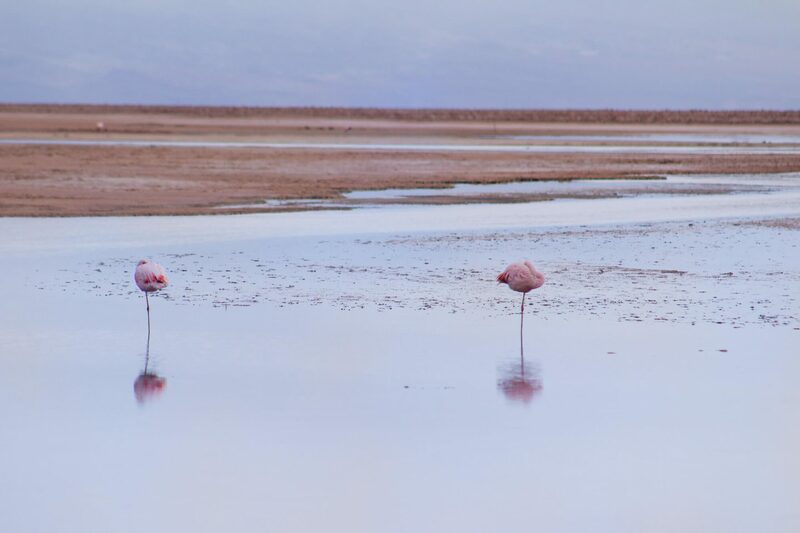 Flamingos can be found at the salt flats, as they forage around the salty water for algae, be warned it can be a little smelly! But there are beautiful birds to witness. This is probably one of the most popular excursions from here, but as its over 50 miles from San Pedro it’s a very early start at 4am. It’s one of the biggest geothermal fields in the world with more than 80 geysers. It’s important to get there for sunrise because that’s when all the action happens and as the sun rises across the geysers they come alive! 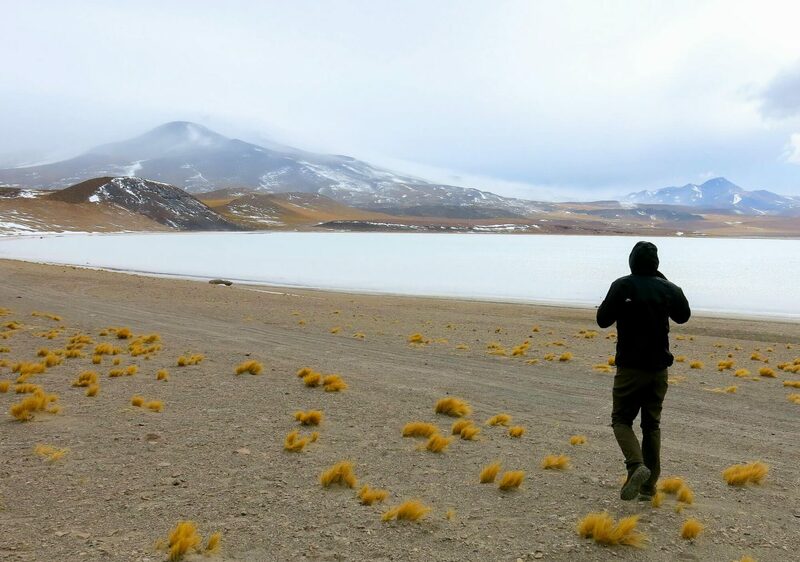 The El Tatio geysers are 4300m above sea level so make sure you take it easy the night before to help ease any altitude sickness you may have. Tours will include breakfast but still bring water and snacks and remember to layer up! Even in the summer months it can be extremely cold up there. And bring your swimming costume in case you fancy a dip in the hot springs afterwards to warm up! This unfortunately was one of the excursions we couldn’t go on due to the bad weather. We heard from everyone we spoke to that it is an incredible sight to behold, so book this first! This was my favourite tour of our whole trip to the Atacama Desert! 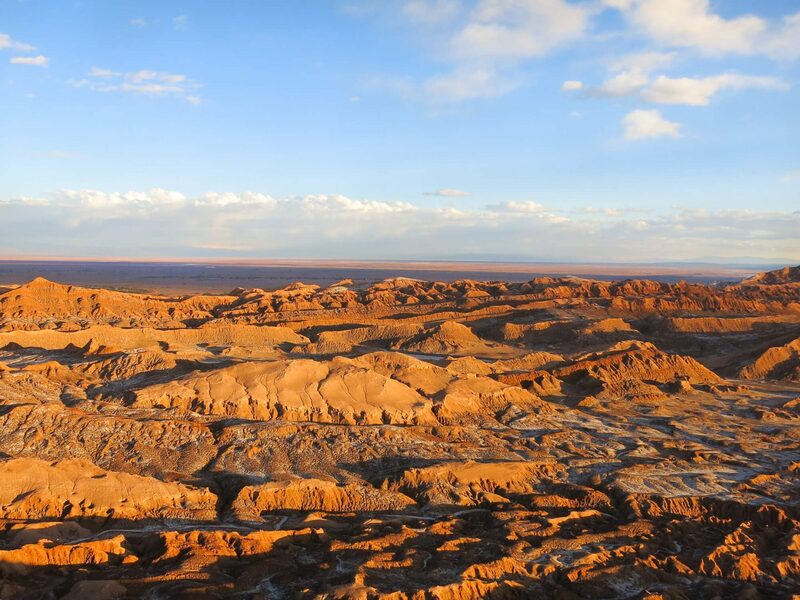 El Valle de la Luna or the Moon Valley is literally out of this world. You could easily think you have just stepped foot onto Mars! And the experts think so too – both Nasa and the European Space Agency have used the area for testing Martian rovers because the landscape is so similar. To take in these stunning lunar landscapes take an afternoon tour so that you can explore the sand dunes, rock formations and views at sunset. It may look like snow but its actually salt crystals. How beautiful does it look! Our tour guide was also an incredible photographer and helped us get to the best spots with the fewest people (as you can imagine it gets busy as sunset). Before heading up to the most incredible viewpoints to watch the sunset. As I soaked up the last of the warm sunshine on my back I tried to savour every moment with the ever-changing colours and view in front of me. It’s the most magical thing I’ve ever seen. This lesser known spot means it’s also much quieter and so feels even more special. 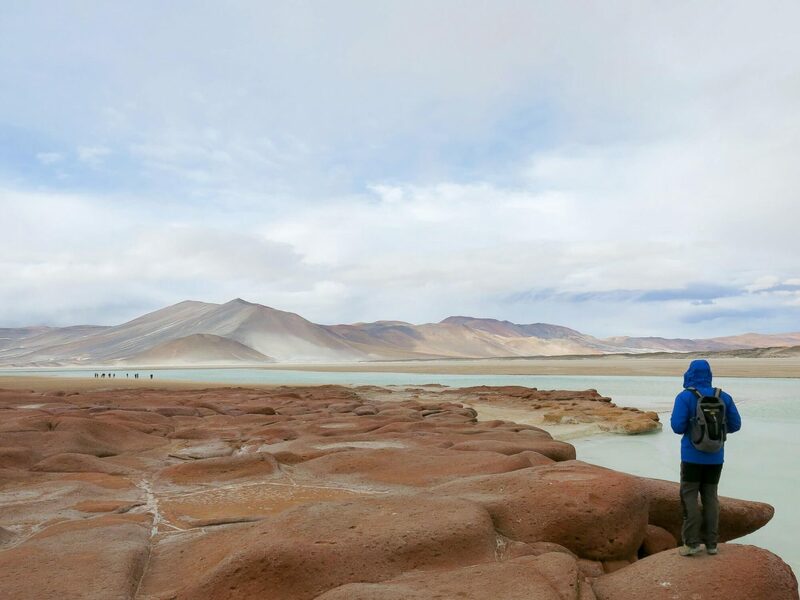 The red rocks lagoon is a stunning spot that we stopped at on the way to the Atacama Salt Flats. This is definitely worth it if you are close by. I loved the red rocks against lake and volcanos in the background. This is one of the best places in the entire world to see stars and galaxies above us. The ultra-clean air and almost zero light pollution means the sky is laid bare most nights for you to see the stars and planets. Make sure every night you look up! Honestly, it’s amazing what you can see with the naked eye. On two nights we saw the Milky Way so clearly. And the sky was full of stars and shooting stars too. There are three major international observatories because of the brilliant environment. There are many different stargazing ‘tours’ you can book. They all differ depending on how much of a star buff you are. They range from groups of 20 where you share a few telescopes between the group and the guide will talk you through the night sky and what you can see before you. Usually ending with a hot chocolate or glass of wine. These are the cheapest kind to book. You can also book longer, more detailed tours where an astronomer will take you to one of the observatories and then talk you through the sky in more detail with a small group and better access to telescopes, most have 1 between 2 people. I would highly recommend doing a bit of research and book a tour that doesn’t have a massive group. Talk to the different tour operators on the ground and get a feel for what you like. Uyuni Salt Flats – this is usually a three day tour to the Uyuni Salt Flats in Bolivia. You can return to San Pedro or continue onto La Paz. These tours leave daily from town. 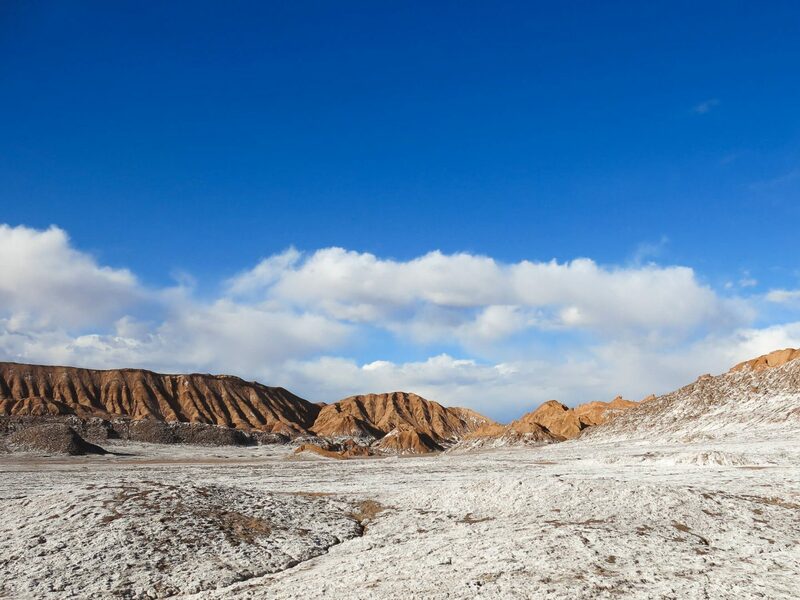 Salta and Humahuaca Gorge – cross the Andes on one of the highest passes in the world into Argentina and see this UNESCO heritage sight as well as some of the most incredible mountains views along the way. You can book tours before you arrive via many online tour operators or you can book when you arrive. There are numerous tour operators on the ground in San Pedro. If you book ahead, make sure you can get a refund if the weather means it’s called off. We booked all our tours whilst there as we wanted to see what was what. If you book there, on the first day make your way around the different places and get a feel for which operators you like, what they offer and prices. Get things booked on the first day to make sure you can do the tours you want on the days you want. Definitely read up about the different tours you can go on before you arrive so you’re clear on what you definitely want to do. If you like to book things ahead of time then Viator is a great place to start. 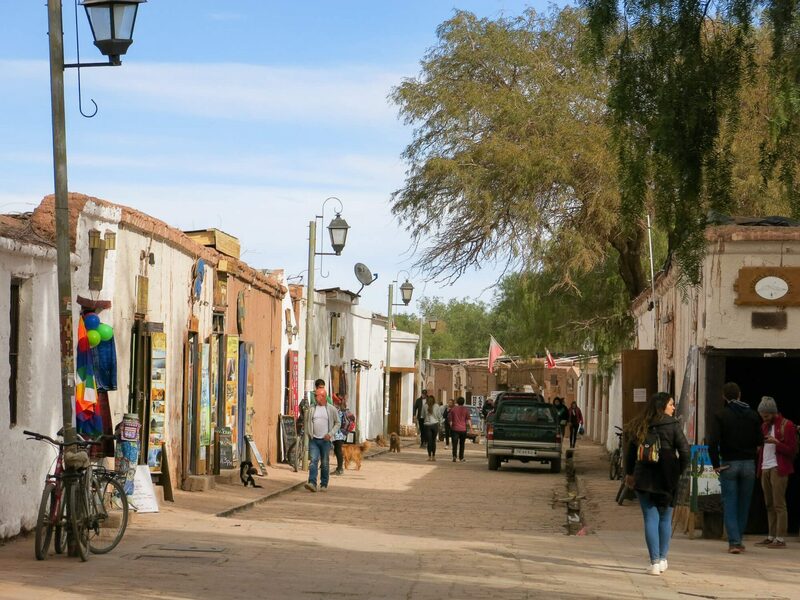 San Pedro de Atacama is a very pretty bohemian town with white washed buildings. The town itself is quite small but it is packed with tour operators, places to eat and drink, from cheap no frills places to high end places to enjoy a special dinner. And there are lots of cute little shops too! You will probably fill your days with tours. But if you are staying in one of the luxury hotels be sure to book yourself into a spa treatment, especially after an early rise and the cold air! We also had a lovely afternoon exploring the town and its little shops. It won’t take long to make your way around, but it’s really rather pretty. As you can imagine this town is a traveller hub, it’s a great place to meet new people. If you are going in winter make sure you check your room is heated well! Ours weren’t! Though where we were staying was super cute and only a 5 minute walk to the main streets in town so if it had been warmer it would have been great with its lovely hot tub and outdoor area. Although there were heaters we could use in our rooms there wasn’t any extra bedding and we had one afternoon of very heavy rain which meant we were stranded in our rooms for a few hours and it was a little depressing! However, on the few occasions the sun came out, it was lovely and warm. Basically, prepare for all weather! 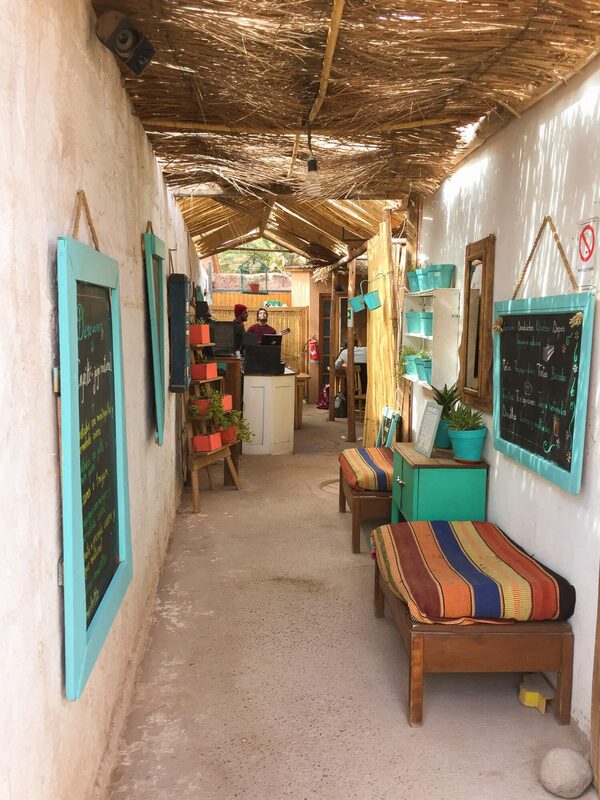 Because it has become such an important base to explore the Atacama Desert from, San Pedro has a great variety of accommodation from very basic hostels to stunning 5 star hotels. Make sure to book in advance if you are travelling during the busies summer months. How many days should you spend in San Pedro de Atacama? The much asked question is: how long should you spend in San Pedro? We stayed for 4 nights with 3 full days. Because weather was not on our side, I wish we’d had an extra day so we were more flexible with a few of the tours. But it depends what you are doing this stop around. If you have the time I would spread it out a little more and do 5 nights. Especially if you are travelling there in winter, just in case of the weather. It just gives you a little more flexibility and it means if you stay in one of the nice hotels you can really utilise it facilities in between tours. But if you are travelling in the summer then I think 4 nights is enough with three full days, you can still fit in all the major tours, with the Geysers and sunset at Moon Valley being able to be done on the same day. Just give yourself some rest! The closest airport is Calama, about 1.5 hours drive from San Pedro. We flew from Lima, Peru to Calama, Chile. It was a very long travel day – I think we were travelling for nearly 14 hours in total as you have to fly via Buenos Aires as there is no direct flight from Lima. We also found flights in South America to be expensive! It’s much better to fly from Santiago which is only two hours away and much more affordable. It was easy to pick up a taxi from the airport and it’s a beautiful drive through the stunning landscapes. You’ll be itching to jump out and start taking a million photos! What a trip, Vicky! And I love those photos of the incredible landscapes. Would love to travel round there one day.. It really was such an incredible trip, Aaron! I can’t recommend it enough, even in the cold! Atacama was a big surprise for us too on our South America trip. It turned out to be the unexpected highlight of the trip! Exactly the same for us. Every new place we went I was just like “wow”. Loved it! Thank you Margie! Before we planned to visit Peru, I hadn’t really thought about Chile either. But the more we looked into it, the more we fell in love. Its so beautiful here! Oh I can’t recommend it enough!! I wish we’d had longer to explore more of Chile. But Argentina also has lots to offer too. I would just avoid winter. But definitely go!! Oh wow, what an amazing sounding trip!! I’ve spent any time in North America, so that’s on my list. Oh I’m glad the Atacama Desert is on the agenda. If you spend time traveling down the western countries of South America you will definitely encounter all weathers! That why I loved it so much. Even whilst doing the Salkantay trek to Machu Picchu we went from snow to jungle! Thank you Clare! It’s definitely a photogenic place. I said wow about 50 times a day when we were out there. I’d love to go back! The desert landscape is so lovely! The barrenness and shapes of the rocks appeal to me. Your photos are stunning! Thank you Sharon! Its a very beautiful place, I couldn’t stop taking photos! This place looks incredible and your photos are fantastic. It appears that you have the whole desert to yourselves. On some tours it really did feel like we had the whole desert to ourselves. It’s such a special place! Thanks Nicky! Its such a beautiful part of the world. I definitely want to go back! I’m glad I’ve inspired you Katy! 🙂 It is definitely a place of contrasts. I couldn’t get over it’s beauty! This is so interesting to read as it’s a part of the world that is completely unknown to me. It reminds me of some of the landscapes we encountered in Iceland. Incredible photos! Yes, the really misty shots really remind me of Iceland. Somewhere I’d love to go soon! I didn’t know much about the Atacama Desert before I went, but as you can tell, I highly recommend it! We had an awesome trip, though there was a lot we didn’t get to see. Next time I’ll definitely be going to Bolivia! You got rained out in the driest place in the world?! What are the odds of that?? 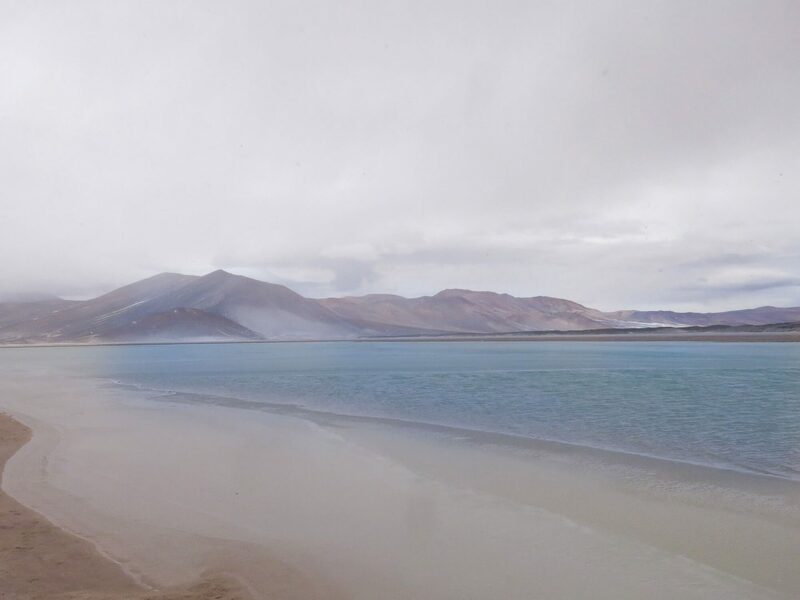 I’ve never been to the Atacama Desert (actually never been to South America) and am still gawking at your photos. The landscapes in this region look otherworldly. I’m sorry you didn’t get to do the geyser excursion – it sounds amazing and reminds me of some of the geyser fields I’ve been to in Iceland, which were absolutely stunning. This is definitely at the top of my South America bucket list now! I know, we were so unlucky with the weather! But even in the cold and wet it was beautiful! Definitely add it to the top of your list for when you go to South America. I’ve never been to Iceland, but now I want to go even more as I hear the landscapes are similar. Wow that must be an amazing 3 weeks trip in Southern America. Atacama Desert is new to me, I haven’t heard of it before but seeing all your photos they are incredible. The landscape is just perfect It should be on the top of the most visited place. Lovely travel! It was such a fun trip! I didn’t know much about the Atacama Desert before I went, but it really is incredible! I’m from South America but have yet to get to Chile. This place looks otherworldly! Well you definitely need to go then! Its honestly amazing. I’d love to explore South America more though. Where are you from? Wow!! 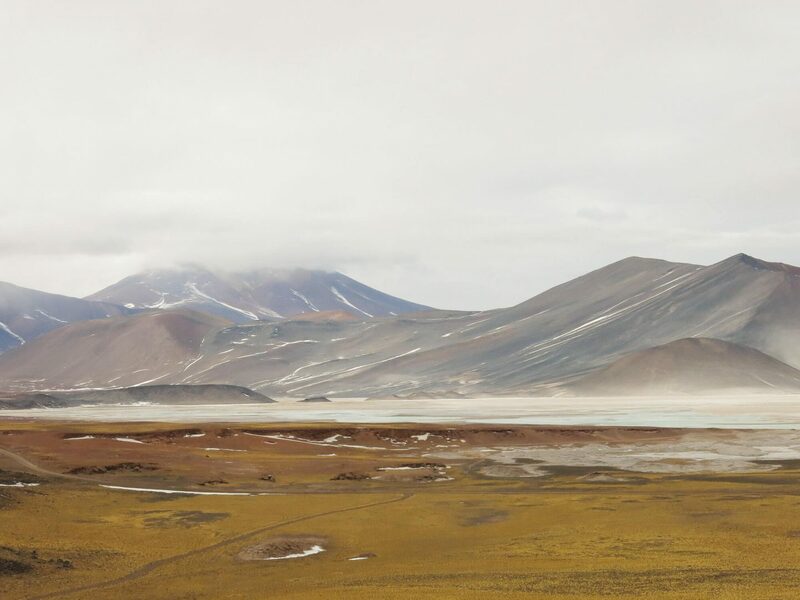 To vist the driest non-polar place in the world must have been simply outstanding!! Atacama Desert is absolutely stunning!! It is such a special, incredible place! I couldn’t get over how beautiful it was. I really hope to go back one day. I can’t get over the diverse terrain! Everything looks so different and somehow all look like they belong on another planet – bet it’s a photographer’s dream, haha. Such a photographers dream. I took thousands of photos! Like you say it was so diverse every place we went. Just so beautiful! Wow this seems like a trip with a lifetime of memories and beautiful unforgettable landscape. The images are spectacular and I can imagine how they just represent just a portion of the beauty of the desert. I would love to see (well everything here) but especially the Salt Flats. Thanks for the amazing tips. Oh definitely so many unforgettable memories. 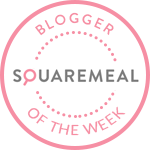 It was so spectacular – I can’t recommend it enough! LOVE LOVE LOVE how much info you gave and how inspiring your photos are, really truly wanting to get myself to SOUTH AMERICA NOW. Between you and this youtuber i’m binge watching, I feel so far from Sur America, and yet so close. Thanks and saving this for a future date. By the way may I ask what camera you use? Thank you so much!! I love writing about travel to inspire others. It was unlike anywhere I’ve ever been. 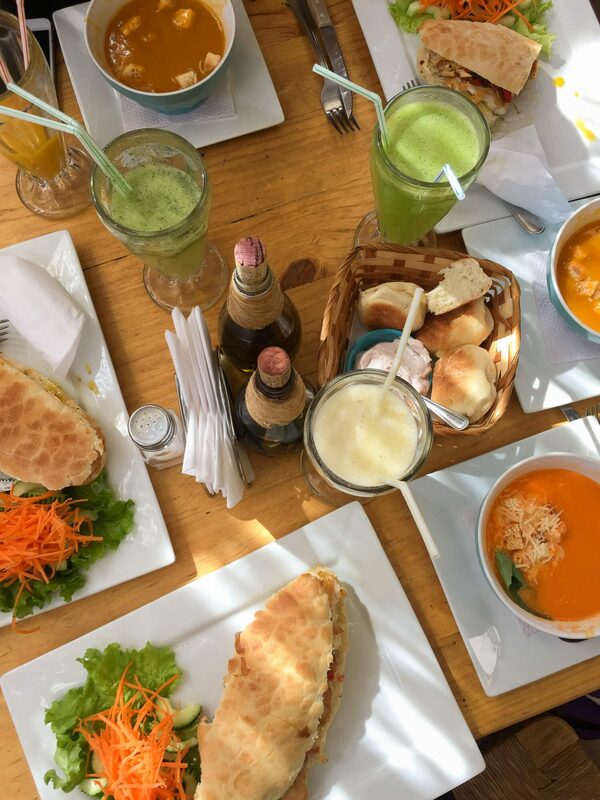 If you ever get to South America you definitely have to add Chile to your itinerary. I use the Canon Powershot G15. Had it for a while now and love it! Though you can’t change the lenses, but its nice and small so perfect for travel. Looks like a unique place hadn’t really considered going before but your photos have now inspired me. Would be easier if I still lived in Argentina. Oh wow – where in Argentina did you live!? I’m my photos have inspired you to go – its such an awesome place! 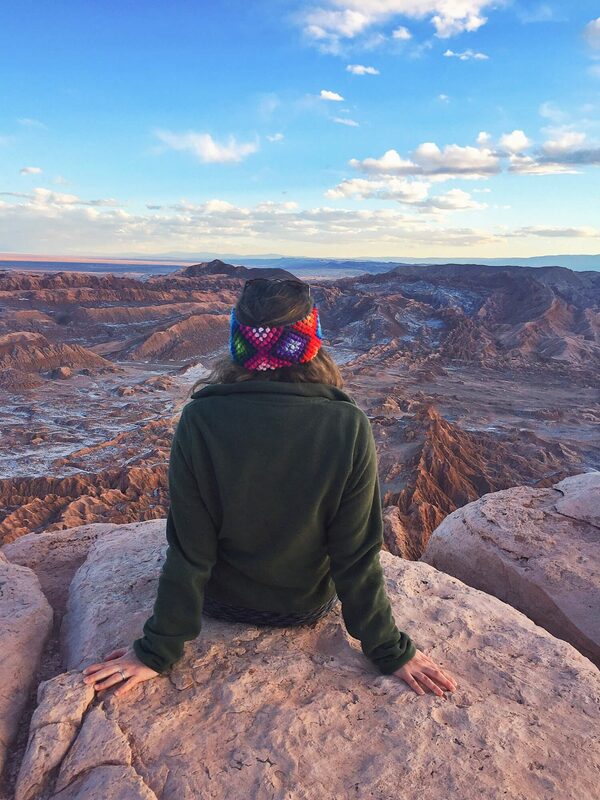 I spent about 10 days in San Pedro de Atacama and loved it. Like you, I loved Moon Valley and also took a star gazing trip which was one of the highlights of my stay. It’s too bad it rained on your trip. We had temperatures over 100, so we were at the other extreme. Regardless, Atacama Desert is an experience people should not miss and you’ve done a great job providing tips! Oh 10 days would have been amazing! I wish we’d stayed for longer. I’m so sad we didn’t get to do the star gazing. I’d definitely like to go back in the summer months to do more of the trips! This seems like a dream trip. 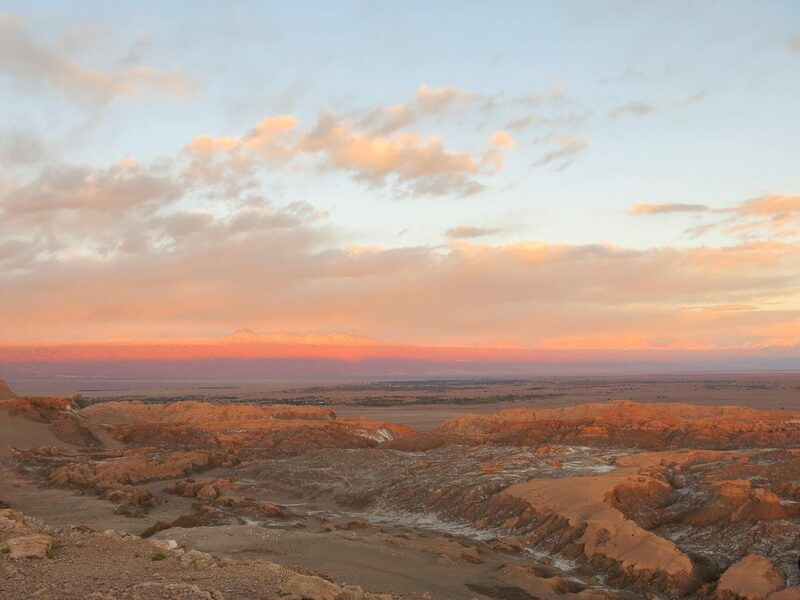 The pictures are so wonderful, the sunset at Atacama Desert is so amazing. Loved those cute flamingos too. It really was a dream trip. The sunset was spectacular! Must have been a great experience. Well-written post with great details, was a pleasure to read. The desert is beautiful, thank you for your photos!